A vast collection of dynamic motion graphic clips designed to be used as backgrounds and/or overlays for a variety of projects. Scroll down to preview the contents of this pack. Read the NLE Ninja review here. This versatile pack of Backgrounds & Overlays, delivered in Full HD, is an indispensable addition to any editors library. Fully customizable using the host's blend modes, speed change, scale, crop and any desired third party or built in effects. They may suit a wide variety of productions including promos, VJing, sport, music, news, corporate, creative videos and more. Import them into your project library, if you wish to create a background for text, logos, mographs or scaled-down video clips drop them in the timeline underneath the selected media. However if you wish to create overlaying subtle effects on top of your videos drop them on top of the desired clip and select blend modes to find your favourite look. Please note that stacking several instances of Backgrounds & Overlays allows the creation of complex and beautiful effects by simply using blend modes. 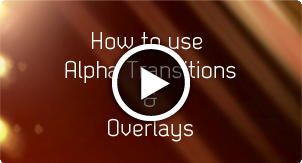 Use effects such as blurring and distorting fx to maximise your customization. They can also be purchased as a bundle with Light Transitions Pack 2.0. Click on the thumbnails below to get a preview of each Backgrounds & Overlays clip. Clips are low resolution and should only be viewed as a sample, please download some demo clips to get a better idea of the quality. The current date and time is Tue 23rd April 2019 :: 02:10:46 at Luca Visual FX Studio in London.